Whereas J.J. Abrams' The Force Awakens was a jubilant nostalgia-filled romp to the first film in the original Star Wars trilogy, Rian Johnson's The Last Jedi energizes the saga's legacy with new breadth, complexity, and intelligence. The Force is strong with this sequel. The battle versus evil rages on Blu-ray with a stunningly gorgeous picture quality, a reference quality DTS-HD presentation, and continues to entertain with a healthy, worthwhile set of supplements, making the overall package Highly Recommended. MILD SPOILER WARNING -- please skip this portion of the review if you want to remain 100% spoiler-free. If The Force Awakens is a homage to the film that launched the Star Wars empire — in a good and highly entertaining way that felt more like a nostalgic tribute than boring duplicate — then The Last Jedi is essentially an echo of The Empire Strikes Back. To be more precise, writer and director Rian Johnson models his follow-up to JJ Abrams' 2015 film after Irvin Kershner's 1980 epic space opera in spirit only, following many of the same plot points and beats without completely seeming familiar or a rehash. Picking up directly where the previous film left off, Rey (Daisy Ridley) is trained in the ways of the Force by a bearded and somewhat disheveled Luke Skywalker (Mark Hamill), now a Jedi Master living in monk-like seclusion, which is not all that different from Luke's encounter with Yoda (Frank Oz). 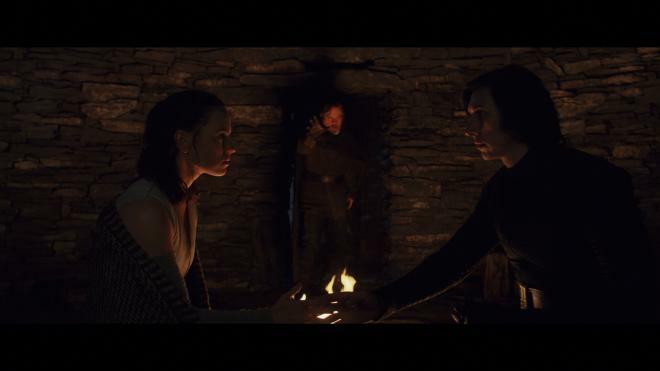 We're even given an unexpected twist concerning Rey's parentage, one which some fans find frustrating while others see as wholly in line with the plot's central theme. That theme is perfectly encapsulated in a single line spoken by Kylo Ren (Adam Driver) — "Let the past die. Kill it, if you have to." — which opens a whole slew of possibilities, directions and packed with poignant meaning, providing this sequel with a darker tone than its predecessor. There is the most immediate and obvious interpretation of Kylo wanting to remove every trace of his former self and family in order to be an individual, an opinion he urges in Rey to adopt during their Force-granted mental conversations. This also seems to include harboring feelings of regret and guilt, as expressed by Luke feeling responsible for Kylo embracing the dark side of the Force or possibly being arrogant enough to think he could bring back the Jedi Order. But on a deeper level, the theme points to the danger of turning the heroes of the past into mythical, romanticized icons without faults. As Luke plainly demonstrates, heroes can be inspiring but are most definitely flawed and capable of poor judgment, and for Kylo, that means no longer idolizing or emulating his grandfather, Darth Vader. Likewise, we see something similar occurring when General Leia (the late Carrie Fisher in her final role) leads her resistance forces away from General Hux (Domhnall Gleeson) and the First Order. In the opening moments, Poe Dameron (Oscar Isaac) disobeys orders, and his defiant arrogance results in the loss of many lives, significantly shrinking Leia's already small army and causing his demotion. As this trilogy's Han Solo comedic relief and unabashed machismo, Poe's fragile hauteur and confident swagger are more dangerous than beneficial when it comes to saving lives. There is a hunger in him to be a hero and perhaps even to be acknowledged for his misguidedly perceived courage. Being recently demoted, he is no longer privy to Vice Admiral Holdo's (Laura Dern) plan, and his hurt pride agrees to Finn (John Boyega) and Rose's (Kelly Marie Tran) side adventure to locate a hacker named DJ on a casino planet named Canto Bight. This subplot is not all that different from Han and Leia's detour to Cloud City, which also goes nowhere except for a carbon-frozen Han. And in a similar fashion to Empire, cross-cutting to Canto Bight introduces some slapstick tonal fluctuations and pacing issues that somewhat stall the movie. 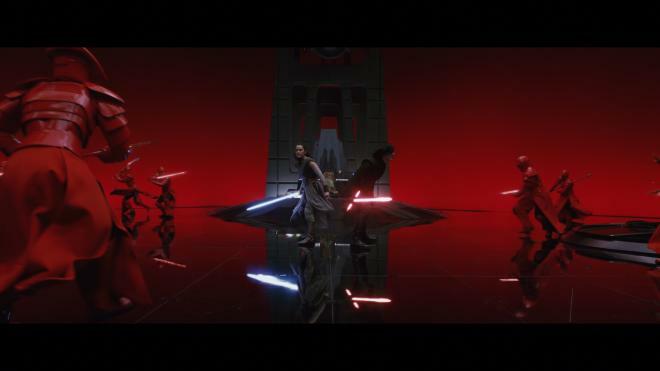 Beyond the script's emotional weight and complexity, Johnson's The Last Jedi is also one of the most visually beautiful and elaborate of all the films in the franchise. 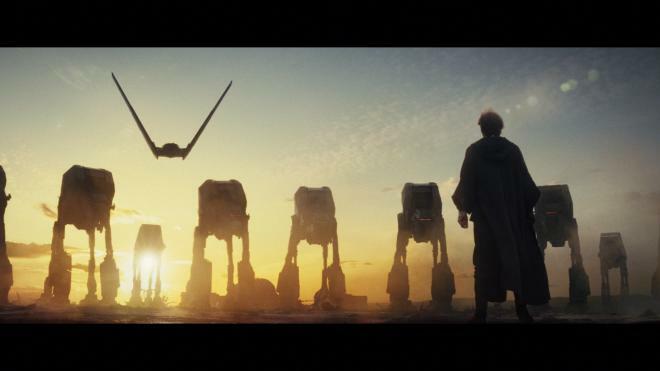 Thanks to the amazing camerawork and photography of Steve Yedlin (Looper, Brick), audiences are treated to some mesmerizing action sequences and stunning, artist-like scenery — one involving the jaw-dropping obliteration of a Dreadnought and another showing a showdown against a line of AT-M6s at sunset. But given that, the production is not without some faults, such as BB-8 coming to the rescue when hijacking an AT-ST or Finn and Rose escaping Canto Bight by causing a pointless stampede. 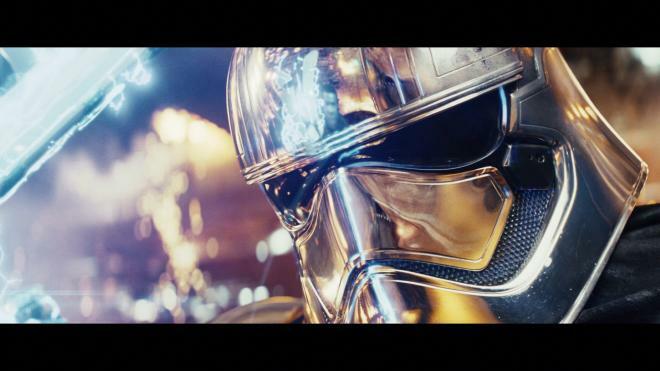 Arguably, the chief missteps in the story are Captain Phasma (Gwendoline Christie) being another Boba Fett — doing little except look cool — and Leia suddenly using the Force with little warning or foreshadowing. In spite of these minor flaws, the film is simply excellent and thoroughly engaging, ranking as the best entry in the series since The Empire Strikes Back. For a more in-depth take on the movie, you can read our review of the 4K UHD with Dolby Vision HERE. 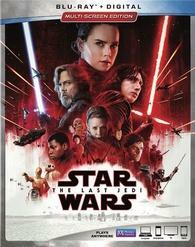 Walt Disney Studios Home Entertainment brings Star Wars: The Last Jedi to Blu-ray as a two-disc combo pack with a code for a Digital Copy. A pair of Region Free, BD50 discs sit comfortably on opposing panels and are housed inside a blue, eco-vortex case with a lightly embossed, glossy slipcover. At startup, the disc commences with skippable trailers before switching to a menu screen with the standard options, music playing in the background and full-motion clips. The Last Jedi steps up to the challenge and becomes the hero of the universe on Blu-ray thanks to a stunningly gorgeous 1080p/AVC MPEG-4 encode. Shot on a combination of traditional 35mm, IMAX 65mm and digital cameras with varying resolution levels, the freshly-minted transfer is simply beautiful, to say the least, showing plenty of razor-sharp definition and clarity throughout. From the uniforms of the fighter pilots and the light-brown suits of officers to the imaginative clothing worn by Leia and Holdo, every thread and ultra-fine stitch in the outfits are distinct and clear. Every gadget, button and loose wire aboard the various ships are plain to see from a distance. On the cold, damp island with Rey and Luke, the blades of grass and the petals of flowers are very well-defined while each pit and black spot on the stones are distinct. Highly-revealing facial complexions expose the tiniest pore, wrinkle, out-of-place hair and negligible blemish in the entire cast. 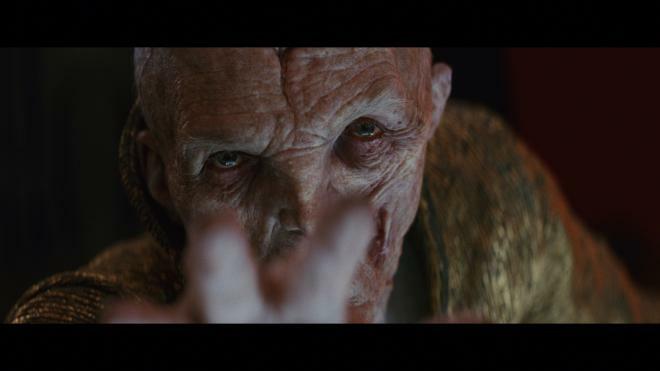 There are a couple very minor, perhaps even barely visible, instances of aliasing along the steps of Snoke's throne, but they're pretty easy to miss unless pointed out. Presented in its original 2.39:1 aspect ratio, the HD presentation also displays an excellent, comfortably bright contrast while remaining faithful to the stylized, slightly subdued photography of Steve Yedlin. From the sterile, clean walls of the Resistance fleet to the clothing of the nun-like Caretakers, whites are immaculate and resplendent, providing the lightsabers a brilliantly luminous glow. The image is awash in deep, rich blacks and dark, midnight shadows without sacrificing the details in the background, and the best reference-quality moments are aboard the First Order's ships where we see clear differences between the black floors, walls and consoles to the many different fabrics used in the uniforms. The palette is brimming with life and richness, and primaries, in particular, are highly spirited, lavishing the screen with bold reds and sparkling, electrifying blues. Secondary hues, like yellows, oranges and a touch of magenta, have a nice pop to them, perfect for the many jaw-dropping sunset shots, and flesh tones appear accurate and natural. Rian Johnson's divisive sequel takes the action across the galaxy with a fantastic DTS-HD Master Audio 7.1 soundtrack, overflowing with lots of activity in the surrounds. Every space battle ignites the room with the zooming boom of the fighters as the roar of their engines circle the listener and rush to either the left or right. The debris from the many explosions feels as though raining all around, and laser blasts flawlessly pan from one channel to the next. Quieter, dialogue-driven moments are layered with various atmospherics, like the bustling energy of Leia's command room or the local wildlife, the wind blowing everywhere and the tranquil sounds of waves crashing on Luke's secluded island. This creates an awesomely immersive 360° soundfield. Equally impressive is John Williams' score smoothly bleeding in the sides and rears, and a couple of the conversations inside the cave echo throughout with a great sense of realism. One thing worth mentioning, however, is volume seeming a bit lower than usual, but after turning it up to -5 from reference, everything sounded fantastic. The design's real strength is across a highly-engaging front soundstage, which is continuously busy with convincing off-screen activity that fluidly moves between the three channels, generating a splendidly broad and spacious wall of sound. Like its Dolby Atmos counterpart, the mid-range exhibits superb detailing and distinction in the loudest, action-packed sequences, allowing for every bit of debris to be heard moving in every direction and for the electrically-charged swords to feel tensely dynamic when clashing with one another. As with previous entries in the series hitting home video, the low-end is not particularly standout or remarkable, but the bass is nonetheless satisfyingly adequate and plentiful. Interestingly, compared to the object-based track on the UHD version, bass also feels somewhat throatier and a tad more aggressive, providing the action with a slightly more appreciable weight and presence. Amid all the commotion and chaos, vocals are well-prioritized and precise from beginning to end, making for an outstanding lossless mix. All the same supplements are shared with the day-and-date 4K home video release, which can be read in more detail in our review of the 4K UHD with Dolby Vision HERE. Rian Johnson's Star Wars: The Last Jedi immediately became a box-office hit, but not without some controversy and to the dissatisfaction of very vocal fans who did not care for the direction the latest installment has taken. Following in the footsteps and in the spirit of The Empire Strikes Back, the sequel to J.J. Abrams' 2015 film comes with a darker tone and more complex theme than its predecessor, giving audiences a highly-engaging follow-up that genuinely surprises and is arguably the best in the franchise since Irvin Kershner's 1980 epic space opera. The epic saga spreads into the Blu-ray galaxy with a gorgeous video presentation and a reference quality DTS-HD MA soundtrack. With a good, healthy collection of bonus features to boot, the overall package is highly recommended for fans of the film and home theater enthusiasts hungry for more demo material.